Tender Slow Cooked Free Range Hog Roasts! 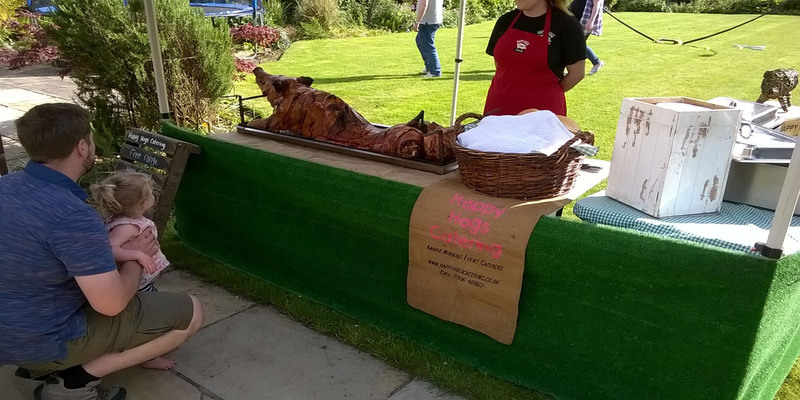 Free Range Hog Roast Hire Yorkshire catering, our Hog Roasts are a great catering choice for your special event or occasion. Yorkshire Hog Roast catering is a simple, no fuss option for your guests and party needs offering piping hot mouth-watering food that will make every event truly memorable. Both outdoor and indoor catering options are available for a hog roast. The Hog Roast is cooked slowly to produce tender succulent pulled pork with crisp crackling by our expert hog roast caterers. Our Hog Roast Hire Yorkshire includes a full service from our team, so when the guests are done enjoying the food service (and had some seconds too!) our cooks and service team will clean up all the mess and collect the plates. We take away all the mess with us so you don't have to worry about tidying up afterwards! The hosts are left to simply enjoy the occasion! Either choose dishes from our Yorkshire Hog Roast menus below, or contact us to tailor our Hog Roast catering options to your exact requirements. Hire a Yorkshire-bred Hog Roast for your special event! The Yorkshire Hog Roast hire package includes a hog roast chef in full uniform with assistant to help carve and serve for the party guests at the required serving time, a small catering marquee 3×3 metres, fresh bread, disposable plates with napkins, and a full cleaning service after the food has been enjoyed. Our hog roast menus includes for salads well-made throw-away knifes, forks and plates, but we do offer the facility to upgrade to 8″ porcelain plates with stainless steel cutlery or 10″ porcelain plates with stainless bead design cutlery. Equivalent upgrades are also available on dessert bowls with stainless steel spoons. Contact us for prices and availability. Hog Roast and Barbecue Caterers available across the York and Yorkshire area.